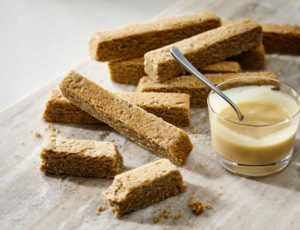 In a bowl, use an electric mixer to beat maple sugar with butter. Add egg yolk and vanilla, and mix well. In another bowl, sift flour with cocoa and salt. Gently combine with the butter and maple sugar mixture. Form the dough into a disk using your hands and wrap in plastic. Leave to chill in the refrigerator for at least 30 minutes. Place rack in the middle of oven and preheat to 160 °C (325 °F). On a floured work surface, roll out the dough to a 1/2 cm (1/4 in) thickness. 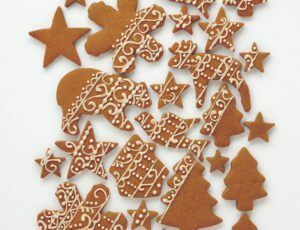 Using cookie cutters of your choice, cut out approximately 20 cookies, making sure to use up the leftover the dough. Bake in oven for about 15 minutes. Remove from oven and leave to cool on a wire rack. Fit a pastry bag with small plain tip and fill it with maple butter. Decorate cookies with joyful designs. N.B. You can use craft stamps to decorate the cookies. Stamp each cookie before it’s baked. Once baked, using a pastry bag, decorate the cooled cookies with maple butter by following the grooves of the stamps.